energeiakozani: Is Europe's freshwater use sustainable? We need freshwater for human consumption and economic activities such as food production and industry, but does Europe manage this valuable resource in a sustainable way? 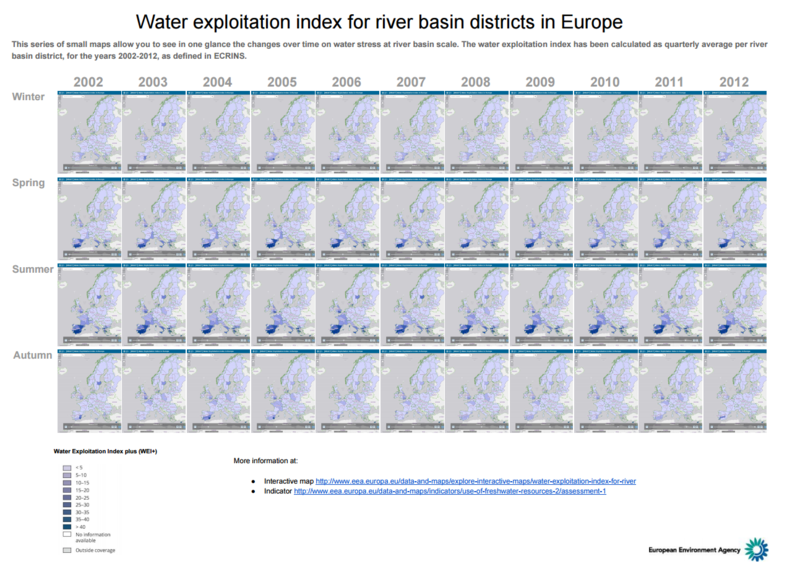 An indicator assessment published by the European Environment Agency (EEA) today on World Water Day takes a look at the use of freshwater resources across Europe. The EEA indicator assessment 'Use of freshwater resources' shows that while water is generally abundant in Europe, water scarcity and droughts continue to affect some regions, especially those that are densely populated and have high demands for water from agriculture and tourism during the summer. The water exploitation index plus (WEI+) of European River Basin Districts is the percentage of total freshwater used compared to the renewable freshwater resources available. The EEA indicator shows that around 20 river basin districts, mainly in the Mediterranean, face structural water stress issues (WEI > 20 %). These include Cyprus, Malta, Crete, the Balearic Islands and Sicily. The situation is even worse in summer. The average WEI for the summers 2002-2012 were 81 % and 55 % for Cyprus and Segura, Spain respectively which suggests severe water stress and clearly unsustainable resource use. 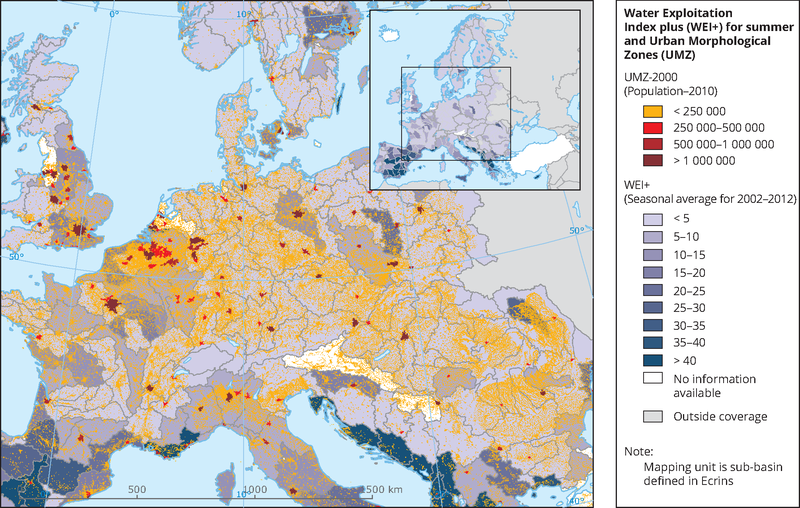 Water stress, increasingly, occurs in other parts of Europe. The main drivers are growing urban populations and higher living standards coupled with reduced water availability due to pollution and drought. Many large cities have developed wide networks for transporting water, often over distances of more than 100-200 km to be able to respond to the demand for water. During winter, approximately 30 million inhabitants live under water stress conditions, while the figure for summer is around 70 million. This corresponds to 6 % and 14 % of the total population of Europe respectively. Agriculture accounts for 36 % of total water use on an annual scale. In summer, this increases to about 60 %. Agriculture in the Mediterranean region alone accounts for almost 75 % of total water used for agriculture in Europe. Around 20 % of the total population of the Mediterranean region live under permanent water stress conditions. More than half (53 %) of the Mediterranean population is effected by water stress during the summer. Public water supply is second to agriculture, accounting for 32 % of total water use. The service sector, including businesses dealing with tourism, has become one of the main pressures on renewable water resources, accounting for 11 % of total annual water use. Small Mediterranean islands in particular are under severe water stress conditions due to receiving 10-15 times more tourists than they have local inhabitants. World Water Day focuses on the importance of freshwater and calls for its sustainable use. This day was first formally proposed during the Rio Summit in 1992. The United Nations (UN) General Assembly responded by designating 22 March 1993 as the first World Water Day. Each year, UN-Water — the entity that coordinates the UN’s work on water and sanitation — sets a theme for World Water Day to highlight a current or future challenge.